Meet the Nikon Z6 and Nikon Z7, Nikon's all-new full-frame mirrorless cameras. 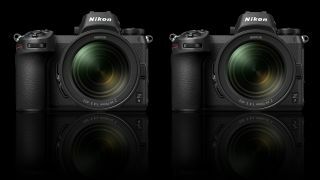 Nikon is calling the arrival of these two cameras its most important launch since 1959. No pressure then. With Sony eating into Nikon's market share with the likes of the Alpha A7R III and A7 III, as with its own user base continuing to ask for a full-frame mirrorless camera, pressure had been mounting on Nikon enter the game. The company has been working on a full-frame mirrorless camera, codenamed Project Q , for some time, with the aim of fusing the best features of mirrorless models with those of a DSLR. However, rather than launching a single model, Nikon has announced two new cameras. In a move reminiscent of Sony's joint launch of its first full-frame mirrorless cameras, the 36.3MP Alpha A7R and 24.2MP Alpha A7, Nikon has given us the 45.7MP Z7 and the 24.5MP Z6. The two cameras share an identical design and handling characteristics, with the only variations other than resolution being burst shooting speed and autofocus, but more on those specs in a moment. Other than the cameras themselves, the big news is that Nikon has decided to drop its famous F-mount, used in both its film SLRs and DSLRs since 1959, for the Z7 and Z6, and introduced an all-new mount called the Z-mount. By introducing a new mount with a much larger-diameter opening than the F-mount (55mm compared to 44mm), Nikon has freed its optical designers to engineer lenses that make the most of the full-frame sensor, with Nikon claiming these optics will surpass the image quality of F mount lenses. The new lens mount means we're also likely to see some ultra-fast f/0.95 lenses – the fastest F mount lens available is a manual-focus 50mm f/1.2 – with a pricey 58mm f/0.95 fast prime expected to be launched next year for the new system. For now though, Nikon's new range of mirrorless optics will be known as S-Line lenses, of which there will be three at launch: a Z 24-70mm f/4 S standard zoom, a Z 35mm f/1.8 S wide-angle prime and a Z 50mm f/1.8 S standard prime. Don't worry, though, if you've got a load of F mount lenses and want to either swap over to the new Nikon mirrorless system or use it side-by-side with your Nikon DSLR, as Nikon is also producing a new mount adapter. Called the FTZ Mount Adapter, this will be compatible with approximately 360 Nikon lenses and support auto-exposure, but if you want auto-exposure and autofocus, this dips down to 93 lenses, though Nikon points out that this is pretty much the entire range of current Nikon lenses. Let's start by looking more closely at Nikon's high-resolution offering, the Z7. This camera features a 45.7MP full-frame back-illuminated sensor with a native ISO range from ISO64-25,600, while the extended sensitivity range runs from an ISO equivalent of IS32-102,400. While the resolution is the same as that of the brilliant Nikon D850, Nikon stresses that this is a different sensor, as it has the Z7's 493 phase-detect focus points engineered into it. Couple with the new EXPEED 6 image processor, this enables the Z7 to shoot at a burst rate of 9fps. The 0.5-inch Quad VGA OLED electronic viewfinder (EVF) sports an impressive resolution of 3.69 million dots, with a large 0.80x magnification and a display rate of 60p. On the rear of the camera is a 3.2-inch tilt-angle touchscreen with a 2.1 million-dot resolution. The Z7 also features built-in 5-axis image stabilization offering up to five stops of compensation, while those wanting to shoot video will be able to do so in 4K at up to 30p. Nikon says the Z7 will feature the same level of weather-sealing as the D850, while it's taken the brave decision to include just a single XQD memory card slot. This certainly allows for better write speeds over SD cards, but Sony is (currently) the only manufacturer of this media, so Nikon is clearly hoping that users will be able to leverage the performance of the new CFExpress-format cards once they become more widely available from a range of manufacturers (these have the same exterior design as XQD cards, but offer improved performance and wider manufacturer support). What about the battery? The Z7 will use an updated EN-EL15b battery to allow for USB charging, but will be compatible with earlier-generation EN-EL15a batteries (as used by the D850 and other Nikon DSLRs) as well, while a MB-N10 battery grip for the Z7 is also in development that will accommodate two EN-EL15b batteries. The Z7 and Z6 are largely identical, with a couple of major exceptions. Where the Z7 features a 45.7MP sensor, the Z6 sports a 24.5MP full-frame sensor with a native ISO range of 100-51,200 (with an extended ISO range of ISO50-204,800). This camera also gets a different AF system, with the Z6 sporting 273 phase-detect AF points, while the burst rate is an impressive 12fps. Interestingly both cameras are not aimed specifically at professionals, with shipping for the Z7 expected to start on September 27, while the Z6 will follow a little later, and should be available in late November. The Nikon Z7 will have a body-only price of $3,399.95 / £3,399, or for $3999.95 / £3,999 as a kit with the new Z 24-70mm f/4 S lens. In the UK, the Z7 will be available with the FTZ mount adapter for £3,499 (the adapter on its own will be £269). The Nikon Z6 will be available for $1,995.95 / £1,995 for the body-only configuration, or $2,599.95 / £2,599 with the Z 24-70mm f/4 S lens. Like the Z7, the Z6 will be available with the FTZ mount adapter for £2,199. Pricing information for markets outside of the US and UK are as yet unconfirmed, but that roughly converts to AU$4,760 and AU$5,450 for the Z7 body and kit respectively, and AU$2,720 and AU$3,500 for the Z6 body and the lens kit respectively. We'll keep you apprised of Australian RRPs when we know more.